Baking pizza wasn't really that quick and the end product was usually a horrible flat base with some tasteless stuffs on it. At least that was the case until I found this recipe on taste.com.au originally from Good Taste 1999. I actually didn't followed the instructions for the sauce and topping but the dough recipe was really good. I modified it a little; if you happen to find any major difference with the original recipe, then it means that I haven't read it properly! I dissolved 2 tsp of dry yeast and 1 tsp of salt in 1 1/4 cups of warm water. Then I added 2 tbs of olive oil and 3 cups of plain flour . After mix it well and knead for a few minutes, leave it cover for 20 minutes in a warm place. 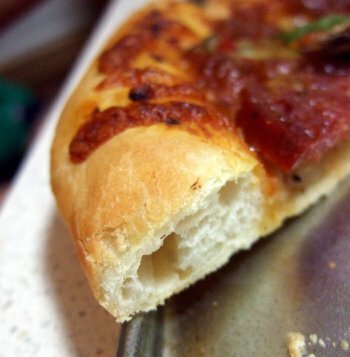 Remember, brush the dough very lightly with oil to prevent it sticking to everything. I made 2 pizza with this dough and baked it in a fan-forced oven for 20 minutes at 200 °C. Please read the original recipe as it contains a lot more information.